Jaguar XJ is a sophisticated saloon model in the fleet of British luxury car maker that is available with a powerful diesel engine options. It comes in two trim levels among which, the Jaguar XJ 3.0L Portfolio is the top end variant. This variant is powered by a 3.0-litre turbocharged diesel engine that has the ability to produce 271.23bhp in combination with a peak torque output of 600Nm. It is mated with an 8-speed automatic transmission gearbox including JaguarDrive selector system. This vehicle is further loaded with JaguarDrive Control system that has three different modes like Normal, Winter and Dynamic. It changes the characteristics of acceleration, braking, engine and suspension to provide desired driving style. On the other hand, this vehicle comes incorporated with an advanced 825 watt Meridian surround sound system along with 20.3 CM full color color display. Furthermore, it is integrated with a navigation system, Bluetooth connectivity for video and audio streaming along with a TV tuner. Apart from these, this vehicle is incorporated with a parking aid system for front and rear with visual display on infotainment screen. This vehicle is placed against the likes of BMW 7 Series, Mercedes Benz S Class and Audi A8L in the lucrative luxury car segment. This saloon has a classy exteriror appearance thanks to its elegantly crafted features. To start with its front profile, it has a large radiator grille that is done up with a lot of chrome and is affixed with company's insignia. It is flanked by a radiant headlight cluster that comes equipped with bi-xenon headlamps along with LED DRLs and turn indicators as well. The front bumper is in body color and is designed with two air ducts along with an integrated spoiler. Coming to the sides, it has neatly crafted wheel arches that are further equipped with a set of 19-inch Toba style alloy wheels. The door handles and the window sills are treated in chrome while the B and C pillars have glossy black finish. This saloon has a lustrous rear profile thanks to its expressive tailgate that is further engraved with company's insignia. The taillight cluster is quite expressive and is equipped with all LED light setup. The rear bumper is in body color that is equipped with a muffler cutter along with two exhaust pipes. Furthermore, it is decorated with with a chrome strip, which further enhances the rear profile. This Jaguar XJ 3.0L Portfolio trim comes with a magnificient internal cabin that is made using premium leather and wood materials. This trim is available with a choice of interior color schemes and real wood veneers that allows the buyers to customize the interiors as per requirement. It has a dual tone dashboard that is skillfully equipped with an infotainment system, instrument panel, storage compartment and several other utility aspects. The front central console has been incorporated with a gearshift console along with a storage box, accessory power sockets and center armrest. The rear central console too has a storage unit along with an integrated tray, cup holders and a glove box chiller. The front seats are electrically adjustable in 20-ways and are further blessed with 3-memory settings. The rear cabin has been fitted with two individual seats that are integrated with 3-intensity massage setting. All these seats have been covered with premium softgrain perforated leather upholstery that pampers the occupants. This vehicle is equipped with several utility aspects like mobile charging facility, storage pockets, room lamps, grab handles and inside rear view mirror with auto-dimming function. This vehicle is powered by a 3.0-litre diesel engine that comes with a displacement capacity of 2993cc . It has six cylinders, twenty four valves and is further integrated with a turbo charging unit. This motor can produce a maximum power output of about 271.23bhp at 4000rpm that yields in a peak torque output of about 600Nm at just 2000rpm. This power plant is mated with an advanced 8-speed automatic transmission gearbox. It takes only about 6.4 seconds to reach a 100 Kmph speed mark from a standstill and it can reach an electronically limited speed of about 250 Kmph. Both the front and rear wheels have been fitted with a set of internally vented brake discs that are further accompanied by superior brake calipers. This mechanism is further enhanced by the anti lock braking system, emergency brake assist and electronic brake force distribution system. It is further loaded with electronic stability program, which works in combination with ABS to keep the vehicle agile on any road condition. On the other hand, this vehicle comes with an advanced power steering system along with a cruise control function, which provides a stress-free driving experience. 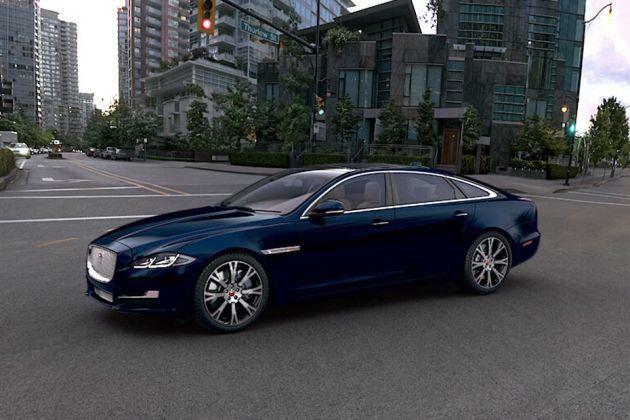 This Jaguar XJ 3.0L Portfolio is the top end variant in its series and is blessed with innovative comfort features. Its cabin is fitted with a four zone automatic air conditioning system including humidity sensing, air quality sensing and air filtration that keeps the entire ambiance pleasant. This trim also includes a JaguarSense that has glove box opening and operation of overhead light console. It also has Jaguar smart key system with key less entry, panoramic glass roof, an interior rear view mirror with auto dimming effect, electric rear side window sun-blinds and new style rear business trays . Additionally, this trim gets features like front sun visors with illuminated vanity mirror, soft door close and full adjustment of front passenger's seat from rear. This luxury saloon comes with a reinforced bodyshell that includes a chemically bonded aluminum body panels and monocoque chassis. It safeguards the passengers inside by absorbing all the kinetic energy caused in case of an accident. This trim comes incorporated with advanced safety features like pedestrian contact sensing system, child seats, airbags and whiplash protection. It is also incorporated with a security system including an alarm and engine immobilizer that safeguards the vehicle from theft or unauthorized access. It is also blessed with parking aid system with audible warnings for front and rear along with visual indicator on touchscreen device. 1. Performance of the engine is quite impressive. 2. Captivating interior design is a big plus point. 2. Presence of authorized service stations needs to improve.